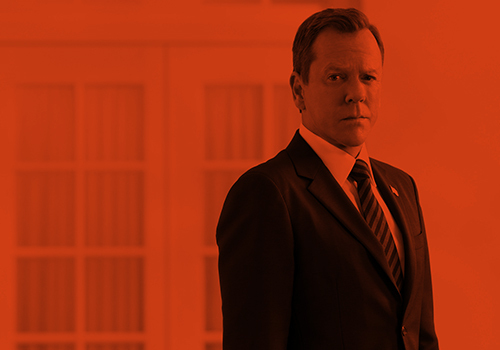 Kiefer Sutherland has said that he doesn’t know how he coped with the physical demands of filming 24. In an interview and photoshoot with Esquire, the 47-year-old actor opened up about filming the hit US series. Sutherland also said that he was struggling to cope with aging, and spoke about turning 45. “That was the first age I ever hit where I started doing the maths,” he said. “‘In five years I will be 50. Oh my God, in 10 years I’ll be 55. In 20 years I will be 65. At 65 you get half-price tickets to f**king movies, holy s**t.
He also spoke about starring alongside his father Donald Sutherland in upcoming movie Forsaken. “There’s something about saying this dialog and telling this story and looking into that face and the experience I have had, like any son does, of wanting my father to be proud, wanting him to love me. He also alluded to the fact that filming the movie together brought the father and son closer together. “Every once in a while I will have a cigarette,” Sutherland continued. “My father is a staunch non-smoker and he finished a couple of days before I did on set. The full interview appears in Esquire’s July issue, on sale Thursday, June 5. Also available as a digital edition. This entry was posted by Courtney on Thursday, June 5th, 2014 at 1:12 pm. It is filed under 24, 24: Live Another Day, Interviews. You can follow any responses to this entry through the Comments Feed.